I inherited achy muscles from my mom. So it is no wonder that I love massages and can appreciate the therapeutic benefits of a hot tub. Saunas and steam rooms, though, are too claustrophobic for me. Recently I had the pleasure of the enzymatic bath. I am a convert! This will definitely be a yearly event at the minimum! 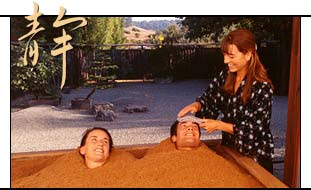 Osmosis Spa in Freestone (on the way to Bodega Bay) is the only place in the United States that offers enzymatic baths. The founder experienced his first bath in Japan and brought the concept here in 1985. Osmosis is designed in a Japanese style. My boyfriend and I arrived and removed our shoes. After changing into robes, you sit in a tea room where an attendant comes to serve an enzymatic tea. It has 25 different enzymes that are absorbed into your system, help with digestion and interact with the external enzymatic bath. When the body is immersed in the Cedar Enzyme Bath, circulation and metabolism are stimulated from outside, giving a boost to the internal organs which usually perform these functions on their own. This is part of the reason the bath is both relaxing and energizing at the same time! After about ten minutes you are escorted to the bath rooms. The baths are big bins filled with a mixture of cedar shavings, rice bran, and plant enzymes. The attendant has scooped out “beds” for you. You step in and lie down and she quickly scoops the sawdust mixture on top of you. It is liked being buried at the beach, but this is sawdust and it is HOT! The heat in the Cedar Enzyme Bath differs from other heat treatments in that it is produced biologically by a fermentation process. The largest organ of the body, the skin, comes in direct contact with intense enzyme activity in the Bath, which, in addition to heat, produces its own electro-chemical environment. This combination of heat and energy influences body chemistry and natural cleansing processes, and breaks down body wastes in the subcutaneous layer of the skin. The surface of your skin, your pores, and even the cells themselves are thoroughly cleansed. The sawdust mixture is fermenting, which creates the heat. It is also very fragrant because of the cedar and the enzyme mixture. The attendant checks on you every five minutes and the longest you stay in is twenty minutes. You can shift or get out at any time. After ten minutes I could feel my heart beat and I was sweating profusely. I took my arms out so that I could regulate myself a bit. After fifteen minutes she sat us upright and scooped the sawdust behind our backs so that we could slowly cool down before stepping out. Finally we stepped out and we were covered with the sawdust. We looked like fuzzy cave people! We took brushes and brushed off as much as we could before stepping into the showers. After the bath you can continue to a massage or facial. Because they were fully booked, we could only do the bath. Once we were in our robes they took us up to a private lounge and we laid down on futons. We put on headphones which played a special meta-music. This music was developed at some university that showed that through the use of stereo and different sounds coming from both sides, your brain waves react, synchronize, and can “encourage” you to different states. Our CD was meant to relax us. My boyfriend was snoring in no time.